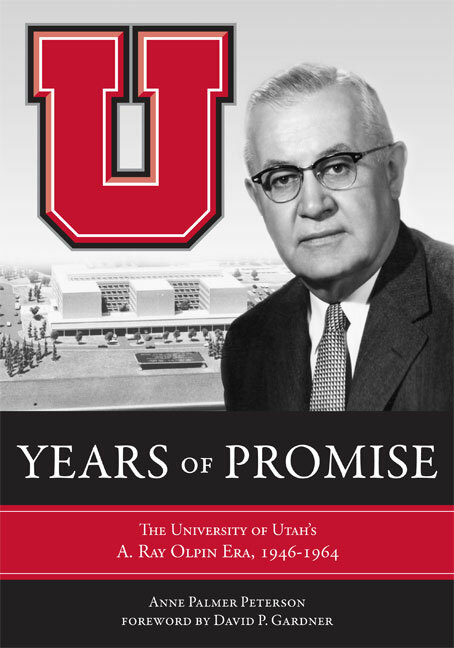 Years of Promise reveals the crucial role that university president A. Ray Olpin played in transforming the University of Utah from a provincial college to a first rate national university. Based on historical recovery work and analysis of archival records, this dramatic narrative provides an authentic and compelling account of Olpin’s tenure as president, placing him as a central figure in a key period in American higher education. With the end of World War II and the mid-century age of innocence, the University of Utah could have easily persisted as only a regional institution, a shadow of the international university it is today. Much of the success for that transition is owed to Olpin’s bold recruiting of new faculty with research interests and teaching abilities that would give rise to a grand new academic program. An influx of returning soldiers tripled enrollment from 4,000 to 12,000 during Olpin’s administration. Steady and selfless, Olpin worked diligently in resolving challenges less frequently faced by larger, more established institutions, including defending academic freedom and educating local politicians about the potential for the University of Utah to become the state’s flagship university. Featuring a foreword by University of Utah president emeritus David P. Gardner, and a collection of outstanding photographs, Years of Promise is a portrait of uncommon leadership and foresight and a chronicle of how these traits shaped an unlikely university into the respected institution it is today. Anne Palmer Peterson is historian for the University of Utah. She is a former editor of Continuum, the magazine of the University of Utah, former staff writer for The Salt Lake Tribune, and former stringer for Time magazine.